Let’s add some fire to our vocabulary. A few days ago, I wrote a blog on the uses of word FIRE in different situations and scenarios. Now, we’ll move a step further in the same direction and explore some FIRE IDIOMS AND PHRASES. • Clearing the driving test is like a piece of cake for me. Hence, the bottom line is that Idioms are such group of words that have a figurative and popular meaning hidden behind them and that meaning is totally different from what the words in it literally mean. You cannot and you must not try to translate the words used in an idiom or else you’ll find yourself in a pickle. All you can do is learn their meanings and try to use them frequently, and you are good to go! Now, let’s learn some FIRE IDIOMS AND PHRASES and as I said before, add some fire to our vocabulary. • You are playing with fire by accepting his challenge. • I think our PM has a fire in his belly to make this country better. • The minister was breathing fire over an article written in a leading newspaper. • Nancy came under fire for her racist comments about a colleague. • Your inspirational words have fired me up to follow my dreams. • Whenever my parents fight, I end up coming between two fires. • After her opponent attacked her personally, she decided to fight fire with fire. 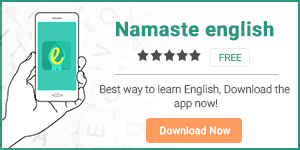 To improve your communication skills in English, download our English learning app Namaste English.